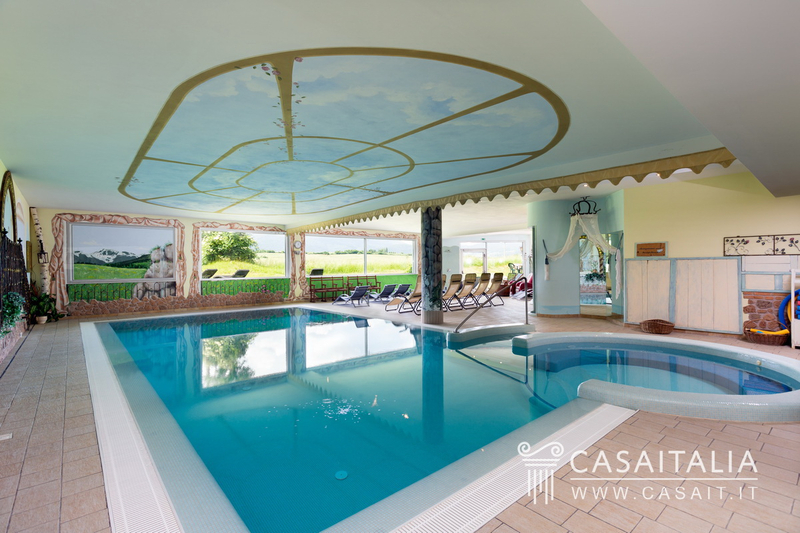 Elevator, Exercise Room, Garden, Pool, Sauna. Balcony, Exterior Lighting, Outdoor Living Space, Sunny Area(s), Swimming, Terrace. Garden View, Mountain View, Open View, Panoramic, View. 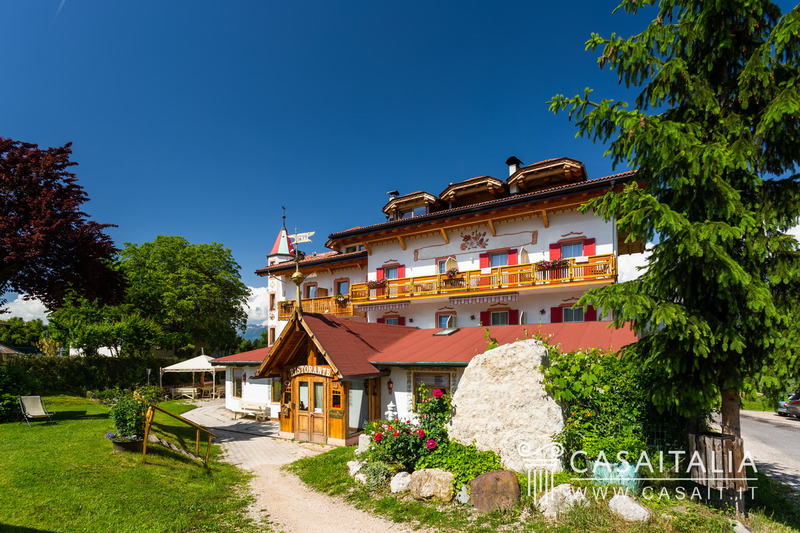 Stunning hotel with view of the Dolomites, next to one of the most beautiful Alpine golf courses, restored and extended in 2010 with bar, restaurant, 38 bedrooms and suites, wellness area with indoor pool and large private garden. Geographic position The resort is on the outskirts of a pretty hamlet in the Non Valley, surrounded by green lawns with a view of the wonderful golf course next door. 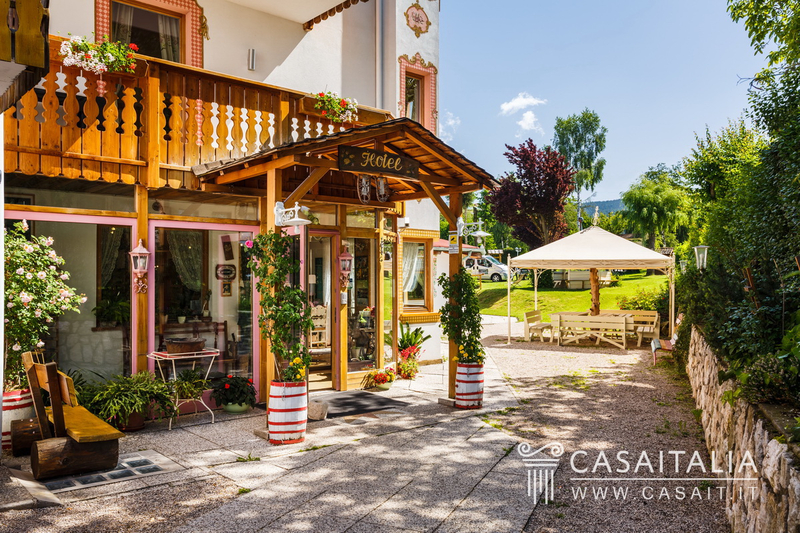 The centre of the village is around 300 metres away and the location is pleasant and peaceful. 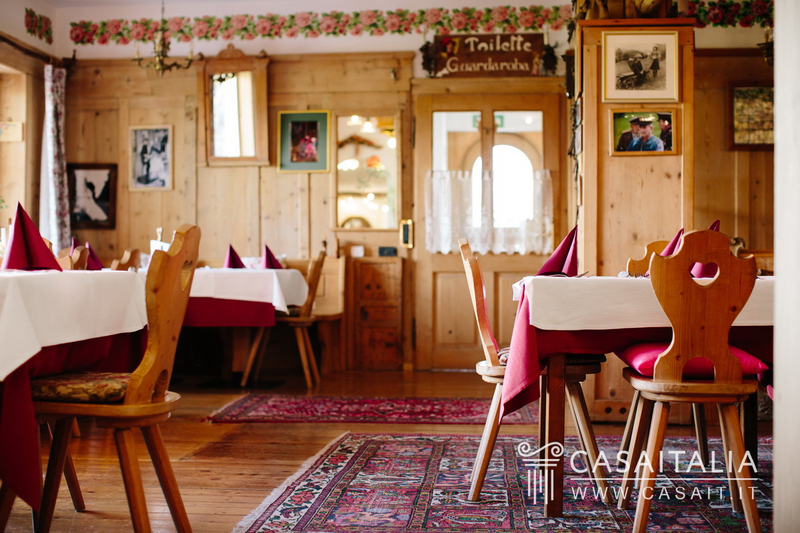 It is situated 20 minutes’ drive from Cles(17 km), the area’s main town and the place to go for daily requirements, while you can get to Bolzano (30 km) in around half an hour and Trento (49 km) in less than an hour. The famous Merano thermal baths are around 40 minutes’ drive away (45 km) as is Marilleva, with its connection to the Madonna di Campiglio ski area (40 km). The nearest airports are Verona Villafranca (140 km) and Bergamo Orio al Serio (225 km), which can be reached in an hour and forty-five minutes and two and a half hours, respectively, and have connections throughout Europe. Description of buildings The hotel, which measures 3323 sq.m in total, has five floors, all connected by a lift. 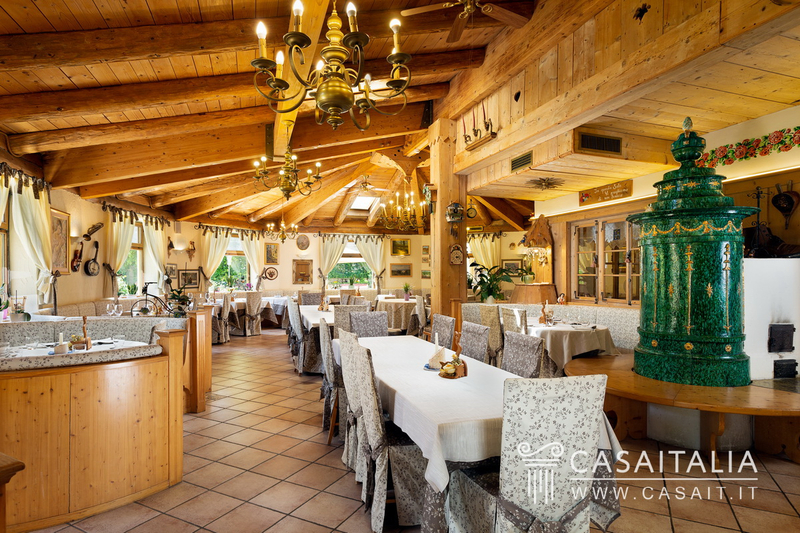 On the entrance floor there is the reception, with the offices, the spacious lounge area with bar and the restaurant, which is open to the public, the kitchen with service areas and the pleasant outdoor spaces. This floor measures around 655 sq.m in total. 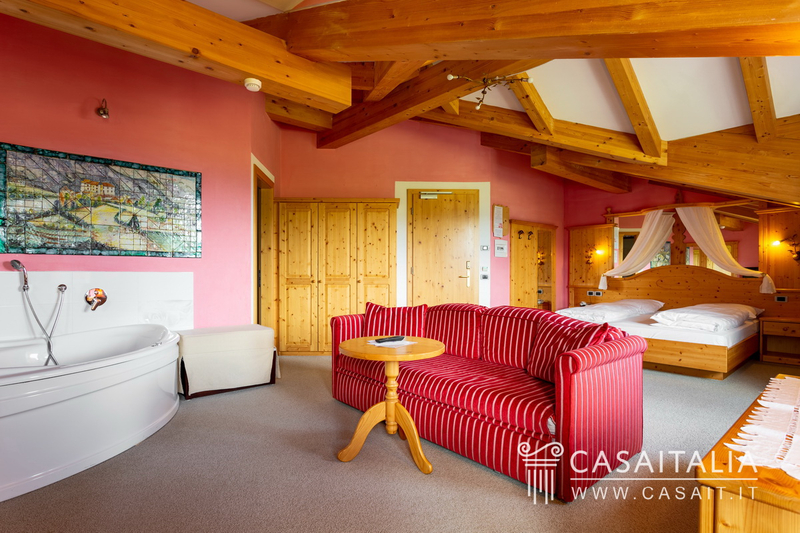 There are bedrooms with bathrooms on the first floor (measuring around 480 sq.m) and the same on the second floor (which also measures around 480 sq.m) and the attic floor, which measures 240 sq.m, where you’ll find one of the hotel’s most beautiful suites and the manager’s apartment, measuring around 100 sq.m. All the bedrooms and suites benefit from an outdoor space, either a balcony or garden. 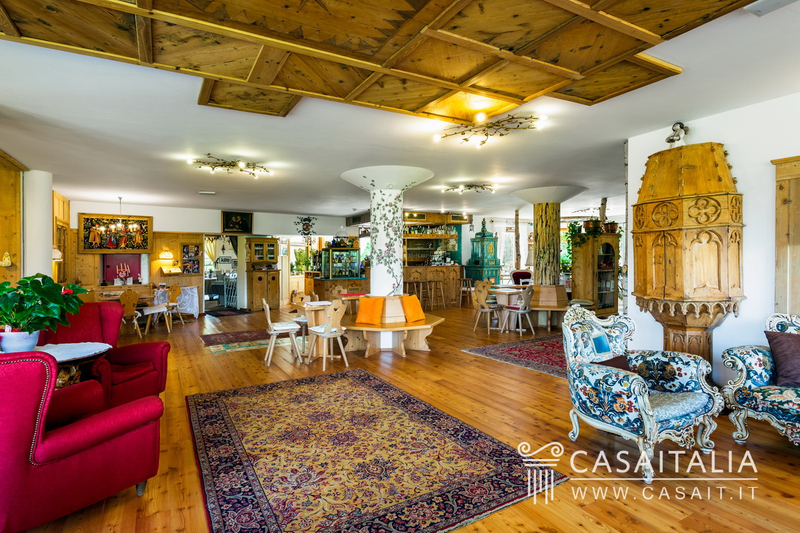 On the basement floor there is the large wellness area: a spacious area with spectacular views from the windows, where there is the indoor pool and next door, an area with sauna, Turkish bath, massage room and gym. On this floor there are also various areas used for changing, laundry, and a variety of storage spaces. 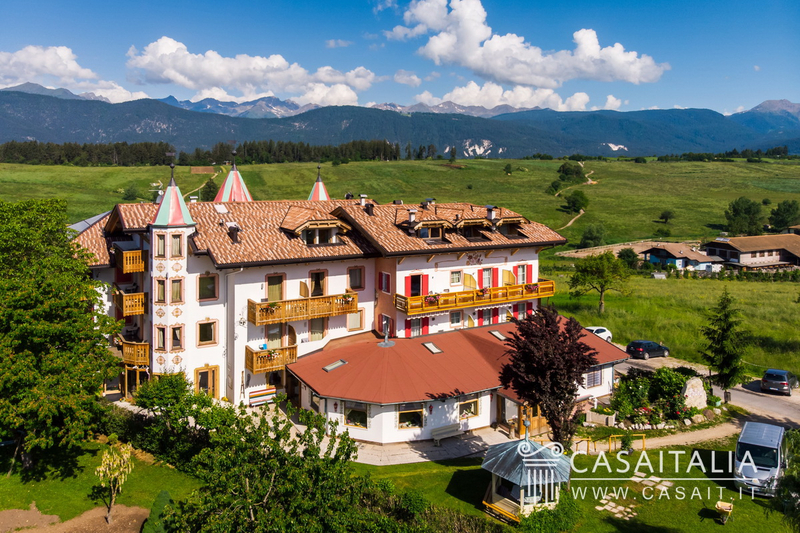 State and finishing The Dolomiti Golf Resort is in excellent condition due to the restoration and extension of an existing structure in the traditional Trento style. 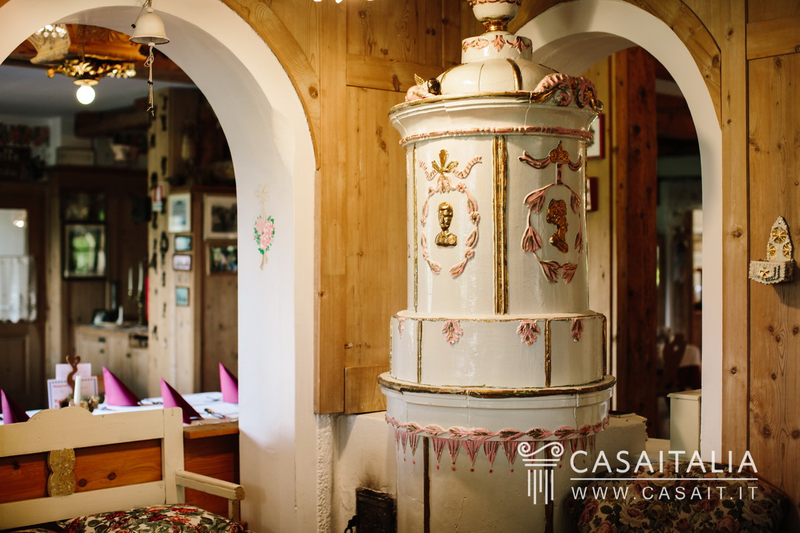 The interiors have retained the traditional rustic construction style and materials, decorated with objects from the owner’s personal collection of Arte Povera: which all come together to provide a warm, welcoming atmosphere. The bedrooms and suites also feature local stone and wood. The many bathrooms are large and most of them have designer fixtures. The carefully selected antique woods go together with state-of-the-art materials, matched with classic furnishings and bespoke furniture. Some of the bedrooms were restored and extended in 2010, along with much of the communal spaces and the wellness area. External areas The outdoor areas are well-manicures, rich in greenery, flowers and tall trees which blend with the gentle incline of the lawns: an attractive area which houses one of the Dolomites’ most beautiful 18-hole golf courses. The resort is surrounded by around 3700 sq.m of private land (including the grounds of the buildings). All the bedrooms have a balcony, a terrace or access to the garden. 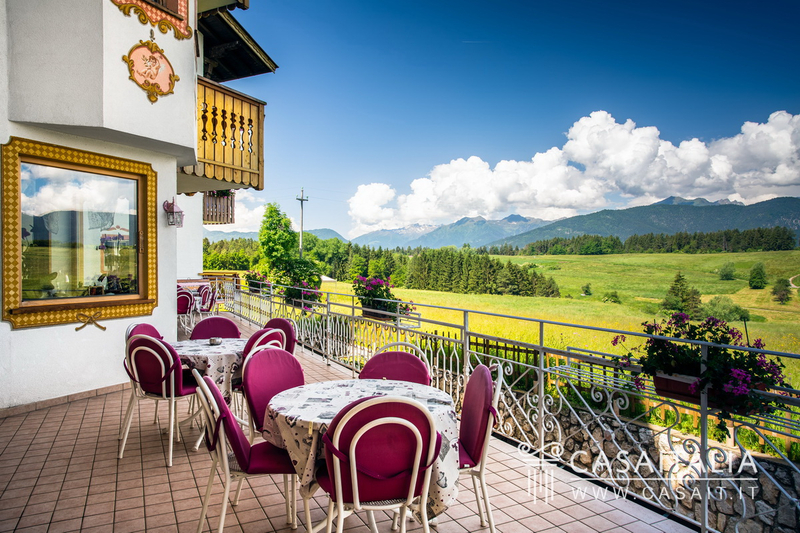 Use and potential uses Its current purpose as tourist accommodation is without a doubt the ideal use for the property, which is situated in a popular, well-known area with a strong commitment to tourism, has a regular turnover and experienced a consistent growth in income in 2017.